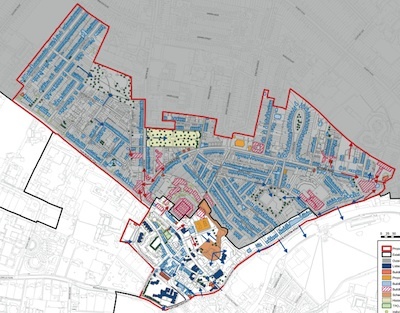 On the 30th of April 2012 I responded to Cambridge City Council’s consultation on a new conservation area for the Victoria Road area and parts of Castle ward. I am writing to respond to the council’s consultation on the Castle and Victoria Road Conservation Area. The ability of residents to modify their homes to make them suitable for the way they live their lives. Making improvements intended to make properties more energy efficient, and reduce energy bills, including replacing windows and installing external cladding, solar panels or wind turbines. The ability of residents to install secure bike parking on their property. Housing costs, the fraction of properties which are rented vs privately owned, and the make up of population in the area in terms of residents’ ages, occupation, and wealth, and types of property use eg, shared houses, family homes etc. Potential future changes to the road environments, eg. signage, cycleways, etc. Without these assessments I think councillors will not be in a good position to assess the pros and cons of introducing a conservation area. I would like to see councillors consider introducing policies which would reduce the impact of any conservation area in relation to such matters. I am concerned that a conservation area will increase the cost of property ownership, and property prices, in the area and push those such as house sharers out. I think the current consultation has been poorly advertised, and suggest consideration is given to if groups such as students, employers, and residents outside the proposed conservation area itself have been suitably consulted. I live within the area assessed, but not the area proposed for designation as a conservation area, I only found out about the consultation when Cllr Hipkin explained he had been absent from a full council meeting in order to attend the public meeting held as part of the consultation process. I think the consultation ought to have been clearer what the impact of a new conservation would be on the lives of those living in the area, both under the current council’s policies, and in a worst case, if a future council were to use the powers obtained by virtue of an area being designated a conservation area in an authoritarian manner. My view is that a conservation area is a substantial incursion on the freedoms of property owners, so there has to be a very strong reason for introducing one. I don’t think there is any such a reason which applies to the residential suburbs of Cambridge in to which we’re seeing conservation areas creep. The council has not explained why it considers it justifiable and proportionate to extend conservation areas into greater swathes of the city, and what benefits, it expects residents, and the wider city and country, to obtain in return for the greater bureaucracy and increased cost of living. Elsewhere in the city we’re seeing calls to use the fact that a property is in a conservation area to prevent parking on a property, we’ve also seen the council accept applications for pruning fruit trees. Personally I’ve considered the fact a property is in a conservation area in Cambridge a negative factor when looking for a home to buy and live in. I didn’t want to be in a position of having to ask the council’s permission to change the colour my back gate is painted. Many of the areas covered by the proposed conservation area would in my view be better designated “areas for substantial change” rather than “conservation areas”. Many properties are small, unsuited to modern life, and not particularly well built, for example many along Victoria Road. I think councillors should consider what has driven these proposals, and if the “historic environment” officers in the council are trying to create work to justify their existence. I also note there is no clear path set out for the area appraised becoming a conservation area. There needs to be greater clarity over, for example, what committees and councillors will be asked to consider the matter, and what if any future consultation will be carried out. If a conservation area is introduced there needs to be clarity overt the date it is in-force from. I note that there is also a potential impact on work in progress to properties when a conservation area is introduced. The council ought ensure all those who may be affected by the designation of a new conservation area are aware of the proposals and how they may affect their projects. Clear public guidance for councillors on how to deal with applications which come in now the potential of a conservation area being introduced is being discussed. The road environments and quantities and types of traffic it is designed for are not addressed. The positive views marked from the Castle are only southerly yet many people climb the castle to observe sunsets. If the conservation area is approved perhaps it would give greater powers to the council to tackle the home made, unofficial, parking signage in Victoria Park (there are similar, smaller, examples across the city). I note the Arbury Fast Fit garage is designated a building which detracts from the area. I disagree, the area isn’t a modern housing estate of identikit buildings, the garage is striking, imposing, and breaks up the street scene. I note that many of the more recently constructed buildings have either been marked as buildings which detract from the area, or not marked as being important to the character of the area. I suggest these findings ought be passed on to those involved in planning and efforts made to ensure future new buildings do have a positive impact on the area, both visually, and more importantly for the way people who live in and use the area. My article commenting on the Romsey conservation area, introduced in March 2011. Cambridge City Council webpage on the Castle and Victoria Road Conservation Area Appraisal consultation. For an example, see The Penny Ferry. The owner was given planning permission to demolish the Penny Ferry pub & build 5 houses. Subsequently the Central Area and Stourbridge Common Appraisal Area has been enforced upon the area and retrospective action is being taken to make the owners comply with conditions which weren’t in force at the time planning permission was given. Presumably, if the building works had been finished all apart from the last brick being laid, the City Council would be making them tear it down and re-apply for permission. The council has unhelpfully removed its webpage on the consultation. I note the list of 2012 consultations is just that, a list, with no links to any details. My husband, Bob King, always said he was born in 1928 at the house called Allways at the top of Castle Hill, now surrounded by redevelopment. I am interested to find out why this house was not demolished with other old buildings during this development. I would be grateful for any information concerning this.